Everyone loves a good cup of coffee and a quiet place to sit and work, hang out with friends, or just enjoy the view of downtown. The Coffee Studio is that place. It is located at 110 Main Street, in downtown Steven Point. The Coffee Studio is open Monday through Sunday from 7:00 a.m. to 5:00 p.m. The Studio was opened in 2011 by Wendy and John Dolan. “My husband John was an architect and was helping build the Children’s Museum downtown. The Children’s Museum wanted a coffee shop for their patrons. My husband thought it would be a good opportunity for us so we decided to go for it,” Wendy Dolan said. Wendy and her husband rent the space for The Coffee Studio from the Children’s Museum. Being located next to the Children’s Museum is great for business because the families like to come in and enjoy a cup of coffee and let their kids play together. “Moms need their coffee when they have young kids and The Coffee Studio is great for families and friends,” Dolan said. The Coffee Studio got its name because Wendy’s husband had an area where he did his work and called it his studio. When they got the coffee shop they thought that The Coffee Studio sounded good. “If I were to change the name I would do Coffee Studio and Café,” Dolan said. “I guess I would say I wanted to own my own business. I didn’t know it was going to be a coffee shop though. It just kind of happened but I am grateful that it did. 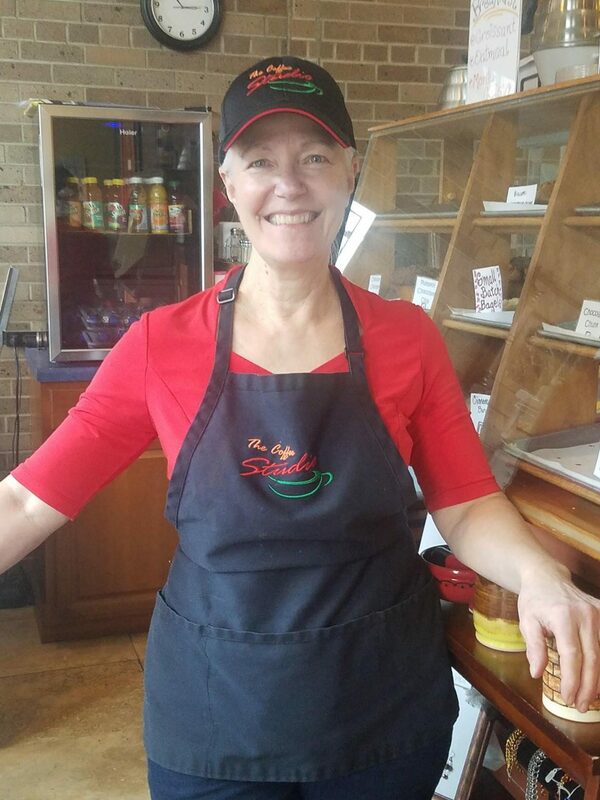 What I love about having my own business is getting to know our customers and their lives,” said Dolan. The Coffee Studio is local and gives consumers a new coffee shop to enjoy and also try their unique drinks and sandwiches. “We have never really thought about getting more than one Coffee Studio. Mainly because it would be hard to maintain. We are comfortable with where we are at,” said Dolan. The Studio’s focus is on offering authentic, quality drinks and sandwiches made with pure, natural ingredients. The Studio does everything from coffees, smoothies, Italian soda, and a very unique Nutella Latte. They make everything themselves. A few items on the food menu include ham panini, veggie panini, spinach salad and more. There is also the option to create your own sandwich or drink that is not on the menu. Everything is fresh and made that day. The reason the Coffee Studio is proud to say they use natural ingredients is that they believe that it produces a better product and is healthier for people as well. They tried purchasing soups in the past but found that if they make it fresh in-house it’s more desirable. The Coffee Studio loves to support local artists. They do this by displaying artist’s artwork around the coffee shop. They switch the artwork in the coffee shop which really gives it an eclectic vibe. “We have had almost 60 artists show their work in the Studio,” Dolan said. because of all the events that take place in the downtown community. “Downtown has a special feel to it,” said Dolan. It’s true that downtown does have a special feel and so does The Coffee Studio. It’s small, with a cozy feel, and a great staff. The Coffee Studio is one of the places that makes our downtown special. I have never heard of this place before and I only ever went to Emy J’s or Starbucks so I think that this would be a great new place for me to check out! I love the small town places because they have a great community feel and value their customers much more than most places do. John and Wendy are good friends on my family, so I go there all the time. It truly is a wonderful little shop. I have not heard of this place, but I will make sure to lookout for it will in downtown. I look coffee shops and having it located in downtown makes it that much better. Good story. I love this place! It has such a good environment and I love being downtown in the shop and watching the world go by. I have never had a bad coffee or food there. I highly recommend the Coffee Studio.